Complimentary Wi-Fi walk-in showers a year-round outdoor pool and proximity to the Apple headquarters are among the perks that lure guests to the non-smoking Aloft Cupertino. Opened in 2013 the four-story Aloft is entirely non-smoking and offers 123 stylish rooms that feature platform beds free Wi-Fi 42-inch LCD TVs plug-in docks mini-fridges and coffeemakers. Walk-in showers and designer toiletries are also included. The 24-hour exercise room helps fitness-minded guests keep up with their workout routines. The outdoor pool is heated for year-round fun. Dining options include a snazzy bar hip lounge and a 24-hour gourmet pantry. Concierge services are available. Parking is free and pets are permitted. 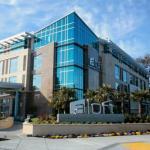 The Aloft is in Cupertino a half-mile south of I-280 and 44 miles southeast of San Francisco. Shopping and dining abound less than six miles away at Santana Row. This Silicon Valley hotel is one block from the Apple campus and a five-minute stroll from Amazon's Lab126. The nine-hole Blackberry Farm Golf Course is two miles away. Norman Y. Mineta San Jose International Airport is 10 miles from the hotel.